House of Wisdom - The House of Wisdom (pronounced Bayt al-Hikma in Arabic) was the most important learning center and library in the world of Islam. It was established in the late 8th century in Baghdad by Caliph Harun al-Rashid, and reached its pinnacle under the reign of his son, al-Ma'mun. As Europe was plunged into the Dark Ages and struggled to recover after the Fall of Rome, the House of Wisdom became a primary institution responsible for keeping much of the knowledge of Antiquity from becoming extinct. Not only did it keep ancient thought alive, but it opened numerous schools designed to continue the advancement of learning. There was an observatory built which became the most important center for astronomy in the world during the Medieval Period. In addition, there were schools of mathematics, medicine, alchemy, zoology and cartography founded. One ambitious project undertaken by scholars of the House was an attempt to map the entire known world. It's interesting that the House of Wisdom opened shortly after the Battle of Talas from which the Abbasid Caliphate acquired the technology of paper from the Chinese; and that acquisition may have played a role in its being built. Reminiscent to the Library of Alexandria during the Ptolemaic Dynasty, Caliph al-Rashid collected texts from the surrounding world and had them translated from their native languages (which included Greek, Sanskrit, Chinese, Persian and Aramaic) into Arabic. By the early 9th century, the House of Wisdom had become such an esteemed institution that it received major funding from throughout the empire. Likewise, knowledge had become a prized commodity and symbol of status within the Abbasid kingdom. To many it was considered more valuable than wealth. As an example, after a conflict with the Byzantines, one of the terms of peace was that a copy of Ptolemy's Almagest was to go to the House of Wisdom. 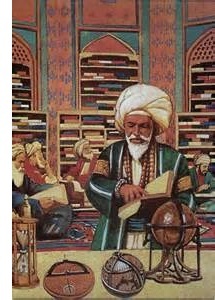 Through the caliphate's efforts, by the end of the 9th century, the House of Wisdom had become the greatest repository of knowledge in the Medieval world; much as the Library of Alexandria had been in the Ancient world. Also like the Library of Alexandria, unfortunately, it was eventually destroyed. In the case of the House of Wisdom, its end came with the fall of Baghdad at the hands of the Mongols in 1258 (see Fall of Baghdad).